Anytime you are on the go, you have to consider how to best carry your belongings. Whether you are heading to work, the gym or are about to head out on a flight across the country or overseas, you will need the type of bag to efficiently satisfy your needs and keep your personal items safe. Since the company's inception in 1987 and subsequent United States' distribution, Kipling has continued to strive to meet and exceed your need for high quality, durability, efficiency and value in your bags; all with an eye toward adventure in your day to day life, as well as your backpack excursions or travels abroad. With a name sparked by Rudyard Kipling, author of "The Jungle Book," it is easy to see why the company has a sense of whimsy yet still aims to help you protect and tote your bare necessities with ease. Note the signature monkey attached to each bag to note the company's namesake as well as the fun-loving nature and sense of capriciousness. This mascot signifies that your purchase means value and adds a personal touch since each monkey key ring attached to a collection of bags has the name of a valued employee from somewhere around the globe. With statistics such as the fact that more Kipling bags have been sold around the world than there are people in Belgium and the fact that 35 million people across the globe own at least one Kipling bag, why wouldn't you want to fill your practical needs with a dose of frivolity. If you are a college student on the hunt for a backpack for your wild treks across campus, you will find a wide assortment of colors, sizes and styles in which you can stow your books, supplies, laptops and more. You can also select from several bags with wheels so you can save your shoulders from the classic student hunchback appearance. Where some individuals are backpack carriers; others prefer messengers and totes. Sometimes the twain shall meet, but it is rare. At Kipling, you can find the messenger or tote in any style that you may be seeking. If you are looking for something more stylish that can double as a larger-than-usual purse of sorts, plenty of the messengers and totes can easily pull off this double identity with charm and grace. 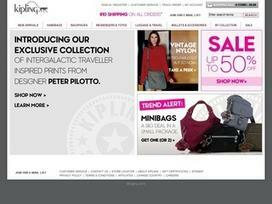 However, if you are specifically seeking out a handbag, Kipling offers a wide range of sturdy and chic satchels. When it comes to luggage, Kipling perpetually finds ways to make improvements to ensure lightweight portability along with plenty of space and organization within. Kipling's vast collection extends to wallets, mini-bags, pouches, travel and school accessories, the famous monkey key rings, and much more. The company's website also offers tips on how to care for your Kipling selections once you have them home in order to keep them in tip-top shape for years to come to accompany you on all of your adventures. Share what you think about Kipling, and your favorite ways to save there!